If you followed the municipal elections this November, you know that regional water planning was a major recurring theme during the lead-up discussion period. 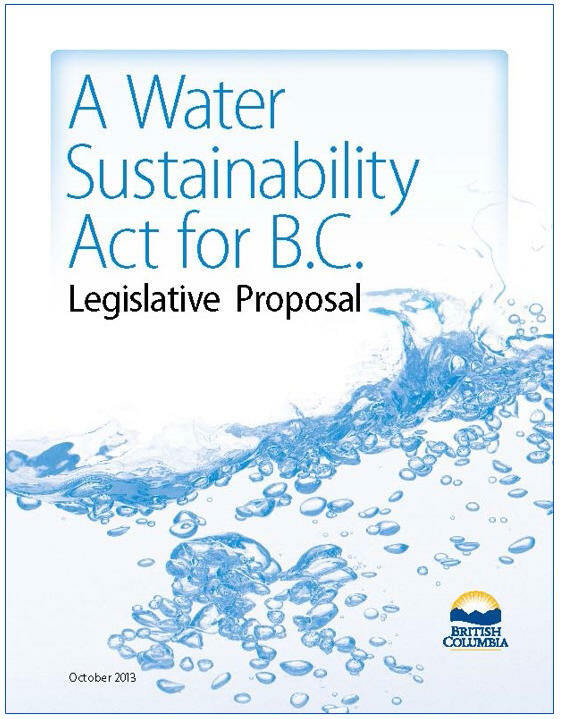 This heightened interest is in step with momentum generated by a new piece of legislation coming into force in 2016 that will change the way water is managed in British Columbia. 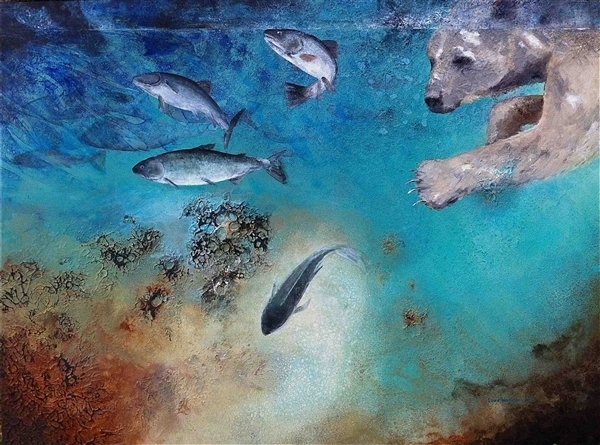 Having recently come from a university setting to work with Lake Windermere Ambassadors, I have sat at tables with diverse water groups and watershed-minded folks across the Columbia Basin and throughout British Columbia who are talking about the new B.C. Water Sustainability Act. People understandably want to know how the Act will affect them. Industry and non-governmental organizations are keen to participate in the development of water policies that will guide water use for future generations. This article is intended to briefly introduce the Water Sustainability Act to the unacquainted and is by no means a comprehensive review. If you’re interested in learning more or reading the actual legislation, I encourage you to look into the resources listed at the bottom of this column, or to contact the Lake Windermere Ambassadors (contact info below). 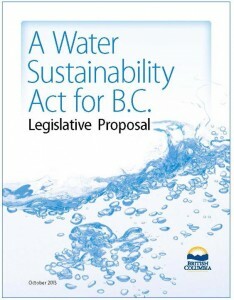 In 2008, Gordon Campbell’s Living Water Smart campaign initiated an overhaul of the former Water Act, written a hundred years prior in 1909. The rationale for modernizing the law was that the rules didn’t reflect Canada’s overall commitment to sustainability. By way of example, the previous Water Act allowed for unregulated withdrawal of groundwater without licensing or payment. Water Pricing is being updated to reflect the ‘real value’ of water and to recover the full costs of providing services sustainably into the future, taking into consideration expenses involved in upgrading and maintaining water infrastructure. The actual structure of pricing is still in the development phase, but a list of seven guiding principles can be found on the provincial government website below. Groundwater Regulations – Without licensing or reporting required for groundwater extraction in B.C., corporations have effectively been permitted to take out large volumes of groundwater for free, without adequate understanding of the ecological consequences. Under the new water laws, groundwater will be regulated in a similar way as surface water. Environmental Flow – The new Act establishes the importance of maintaining water quality and quantity measures for protection of aquatic ecosystems, recognizing the need to protect stream water for ecological reasons as well as to safeguard drinking water. Transparency – The Ministry of Environment has invited public comment on pricing water through a blog on their website. Regulations (read: teeth) of the Act are still being negotiated, and building provisions for public participation into the development of provincial policy in this way is unprecedented. That said, the lack of full consent and consultation sought with First Nations as well as a neglect to account for First Nations rights and title over lands and water resources within their traditional territories has been a glaring shortcoming of the proposed Act thus far. How will these changes affect the Columbia Valley? Although ultimate responsibility and accountability for managing water resources remains with the provincial government, the new Water Sustainability Act enables municipal government and community-based organizations to contribute vital local knowledge to decision-making processes. To effectively contribute to regional water plans, it is imperative that we continue to assemble information needed to build a case for local water priorities and concerns in the Upper Columbia River Watershed. At this point, the ball is in our courts to speak out and take full advantage of a growing water consciousness in our province! World Water Day 2015 is March 22nd. Stay tuned for great events and presentations put on by Lake Windermere Ambassadors and partners to gear up for this celebration and share knowledge of changes in our watershed. With the Water Act legislation adapting to a changing world, now is the time for us to collaborate and collectively decide what our vision is for the future of our local Headwaters.